Review Summary: All in all, Krish has once again come up with a different movie with novel storyline. It appeals the film lovers and class audiences only. It's quite normal that you tend to forget the flaws and appreciate the best things about Kanche, due to its underlying honesty. It may not be there among the best, but the hard work that has gone into its making needs a dab. No HOPE… Sorry Varun Tej.For hero like Varun in budding stages, this is surely burdensome. Analyzing many intangible factors, Cinejosh rates ‘Kanche’ with 1.5 stars. Commercially, how far ‘Kanche’ works at Box Office or in few metro and overseas areas has to be wait and seen. However, success at box office depends on how masses will like the film. In A centres, no doubt the film will register nice collections, but in B & C, audiences need to connect with the message. If everyone loves, then this could be a big hit for Varun Tej and Krish. Else, the film remains a classic, but collections remain under the line. All in all, Krish has once again come up with a different movie with novel storyline. It appeals the film lovers and class audiences only. Kanche is a welcome break for the audience who were bored seeing the same old formula films all the time. This film opens on a decent note and keeps you engaged until the interval point. Love story and war episodes run parallel in an interestingly written screenplay. The film loses steam somewhere during the midway though. Krissh who is known for decent offbeat themes came out with yet another message oriented film dwelling on caste barriers that are prevalent even in present times. Krissh came out with a neat and clean entertainer. It is surely a white feather in his resume. There is no unnecessary comedy or forced temptations to cater mass audiences. Director stuck to the main theme throughout the film. The main merit of the film is its simplicity in the narration without any major complication. He followed his own style and is situational comedy with Avasarala Srinivas evokes laughter. War and love scenes attracts all. He highlighted human values and relations just like he did in Gamyam and Vedam. Climax may put off Telugu movie lovers. So one cannot expect collections though the film win the critics appreciation. Krish should be truly appreciated for attempting a film which will take Telugu films to another level. 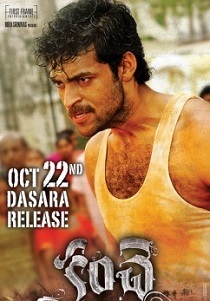 A realistic back drop, gripping visuals and stunning performance by Varun Tej are major assets. Barring the slow narration, Kanche is a film which is devoid of masala entertainment and should be given a shot for its daring and different attempt. He beautiful blended the love story, World War II and pre Independence Indian era and got the optimum out of his cast and crew. In his enthusiasm not to miss any point, he narrated the film in a slow manner. Screen play and direction is ok but everything depends on how masses receive this different genre film which fights against the caste system which is still present in Indian villages. First half of the film is nice with a good narration and an interesting screenplay. We expect the proceedings in second half to intensify as the climax progresses. The latter part of second half appears hurried up and is devoid of emotion. Director Krish should be appreciated for a brave attempt and for narrating a love story with WWII backdrop. On whole, Kanche is brave film with good technical values. The biggest drawback of the film is the pace of the film. Although its 2 hours, it seems like a 3 hour film married with horribly boring songs. The war thread goes monotonous after the first hour. Thankfully, some great lines in between and Srinivas Avasarala’s humour try to keep it alive till the end. The village thread was more appealing and got some potential story moving forward. The most disappointing was the impact-less climax. Not even a quarter of impact that he delivered in Vedam.